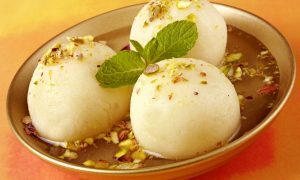 Indian desserts are as delectable and satisfying as is the cuisine itself. The ample sweetness and freshness that lies in Indian desserts keep you craving for more especially when you are at an Indian restaurant in Seminyak. 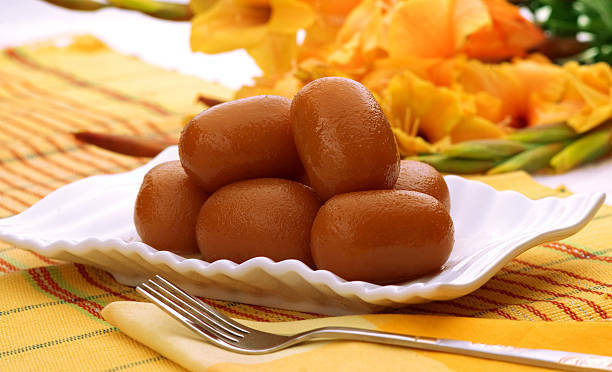 One of these sugar syrup dripping ball of sweetness is known as Gulaab Jamun. A khoya (whole dried milk) filled, pistachio topped fried ball of sweetness, this dessert. Here’s a little insight into the delectable Gulaab Jamun. Go ahead and try it at an Indian restaurant in Bali to tickle your sweet tooth. Made out of a khoya mixed maida (refined flour) dough, these sugar dripping balls are first fried till they turn a preferred shade of brown. Once prepped they are dripped in a generous dose of chashni (melted sugar in water). 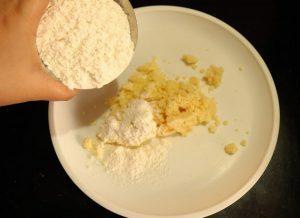 The presence of maida gives it a softness that when bitten into, it just easily melts into your mouth. We assure you the same sweetness at our restaurant that offers Indian food in Seminyak. Our research into this dessert as a restaurant offering Indian dining in Seminyak was important. Folklore admits that Gulaab Jamuns came into existence by accident. These were concocted by Shah Jahan’s cook who took inspiration from Turkish/Persian forms of cooking. Now whether it’s true that it was Shah Jahan’s cook or not is a mystery but there are facts that point to Gulaab Jamun actually being inspired by Turkish or Persian cultures. Persian sweet dish Bahmieh and the Turkish tulumba are actually desserts much similar to the Indian Gulaab Jamun. The former two are eaten cold while Gulaab Jamuns are served fresh and warm much like how they are served at Queens of India Bali. Over the years, variations came into the Indian Gulaab Jamun too on the basis of regions. Kolkata came up with round cylindrical dough balls. This happened due to the Viceroy’s wife’s arrival in India. A renowned chef was asked to prepare something different for her and he came up with this interesting shape for it. She loved it so much, she ended up popularising it and it was named after her; ledikeni (her name was Lady Canning but people ended up pronouncing it so). Another variation of it hails from Kolkata only. Known as patnua, this Gulaab Jamun is small and sweet which is stuffed with misri (crystallized sugar). Next, in the family of variations is one that hails from a temple town in Tamil Nadu; a dry Gulaab Jamun. It comes without the dosage of chashni and is instead sprinkled with caster sugar. The crust of this smaller sized Gulaab Jamun is also crisper than the usual ones, it almost sounds like a churro, doesn’t it? At our Indian restaurant in Bali Indonesia, we serve the original rosy and rounded balls of goodness. Last but not least, next is the famous Kala Jamun. Rather than the rosy shade of the Gulaab Jamun, it has a darker brown shade that it derives from the extra amount of sugar mixed into its batter and then fried at a high temperature.